In a medium saucepan, set over medium heat, add the strawberries, sugar, water and salt. Cover the pan and cook for 2 to 3 minutes, until the berries have cooked down. Pour the puree through a strainer. Discard the pulp and set the syrup aside. To a blender, add the ice cream and milk of your choice. Pulse only a few times (you don’t want it too liquid-y) just until the ice cream is broken up. Add a tablespoons of syrup to each glass. 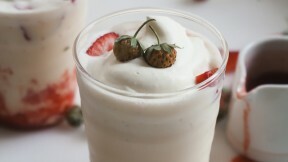 Top with glass with the milkshake mixture, a handful of strawberries and lastly, a big dollop of whipped cream. Serve and drink up immediately.